Can you believe that Halloween is next week!? This year is flying by so quickly that Christmas will be here in a matter of weeks. Crazy! I’m not really one to celebrate Halloween anymore after many nights out having my ears/horn/tail stolen and make up streaming down my face after one too many songs on the dancefloor, but one thing I always look forward to at this time of year is the new releases at Lush! I popped in a couple of weeks back and picked up the pieces from the Halloween range that caught my eye. 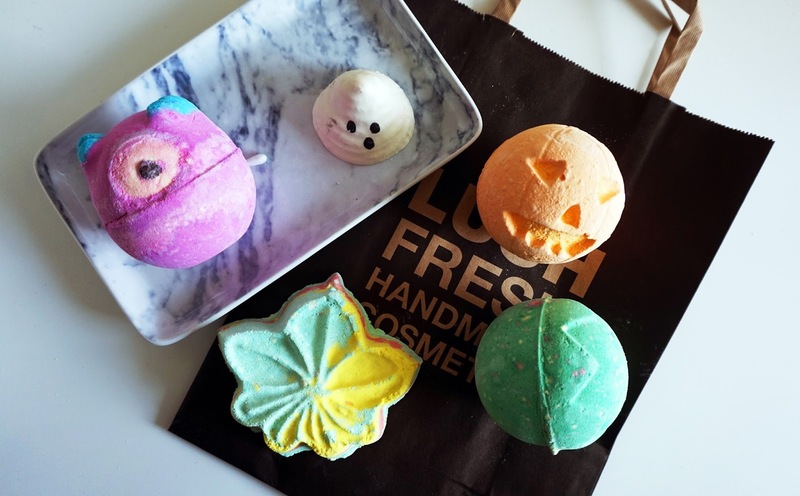 Monsters’ Ball Bath Bomb – This, as far as I know, is a new addition this year and I love it so much already! It’s a gorgeous pink shade with blue horns, that I believe fizzes to turn the bath water purple. The scent is beautiful with lime and neroli oil, and there’s cocoa butter inside to keep your skin silky smooth. Find it here. Boo Bath Melt – How adorable is this little guy?! Again, a new addition this year, this bath melt is one that you pop in the water and let it work it’s magic. It’s made from cocoa butter amongst other lovely things, and leaves the bath smelling a gorgeous mix of florals with a hint of ginger. Find it here. Pumpkin Bath Bomb – I may be wrong but I think this may have been around last year. This is one of the more simple designs when it comes to colour and shape, but it has the most gorgeous scent of pumpkin pie and cinnamon with a splash of fruity citrus. Definitely a winner for a cosy night in when it’s cold outside! Find it here. Lord Of Misrule Bath Bomb – This was one of my favourites from last year, so I was very pleased to see it back on the shelves again this time round. This one has quite an earthy herbal scent thanks to the patchouli and black pepper oil, however slightly sweet with hints of vanilla. Don’t be fooled by the green exterior, as it’s a beautiful deep pink shade inside! Find it here. Autumn Leaf Bath Bomb – How stunning is this beauty? A new addition and a beautiful one at that, this bath bomb has a lovely leaf design with a mix of gorgeous pastel colours. The scent of this wasn’t what I expected it to be at all. It’s quite an earthy fragrance, similar to that of grass. It sounds a little strange, but it’s definitely one I’ll be stocking up on. Find it here. 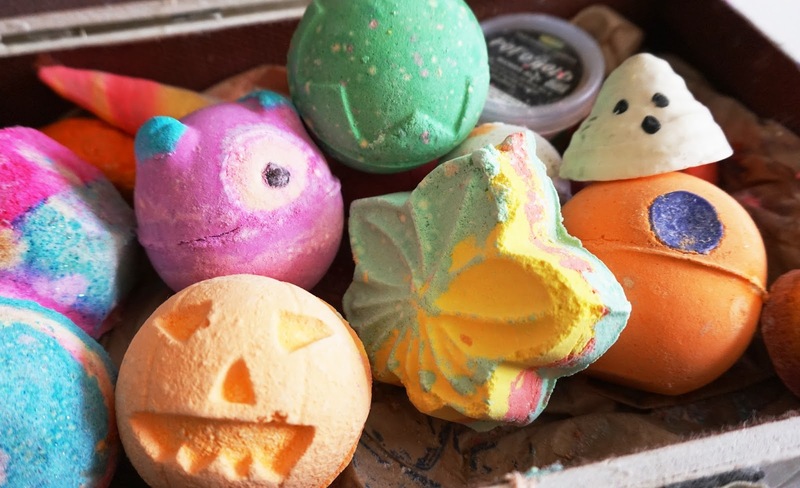 Have you managed to get your hands of any of the spooky Halloween goodies at Lush? Which pieces from the collection are your favourites? "PACKING FOR A WINTER BREAK IN THE SUN"